MADRID — Carles Puigdemont, the former leader of Catalonia wanted in Spain on rebellion charges, was detained on Sunday in Germany on an international arrest warrant, in a move that drags Berlin into Spain’s festering territorial dispute. Mr. Puigdemont was arrested by a German highway police patrol soon after crossing the border with Denmark. He was traveling by car to Belgium from Finland, and had planned to present himself to the Belgian authorities, according to Mr. Puigdemont’s lawyer, Jaume Alonso-Cuevillas. The arrest came two days after Spain, trying to strike a decisive blow against the secession movement, reactivated a European arrest warrant against Mr. Puigdemont and five other separatist leaders. Catalonia has been in political turmoil since its leaders formally declared independence in October and the central government ousted them, assuming direct control of the wealthy autonomous region. Madrid also moved to prosecute Mr. Puigdemont and his allies for rebellion and sedition, prompting some to flee to several other European countries. Now, with Spain renewing its efforts to have the former Catalan officials arrested and returned home for prosecution, Europe may be about to become more embroiled in the conflict. Whether Spain’s newly aggressive posture would weaken the independence movement or strengthen it was not immediately clear. In Catalonia, the effect of Mr. Puigdemont’s arrest was immediate. 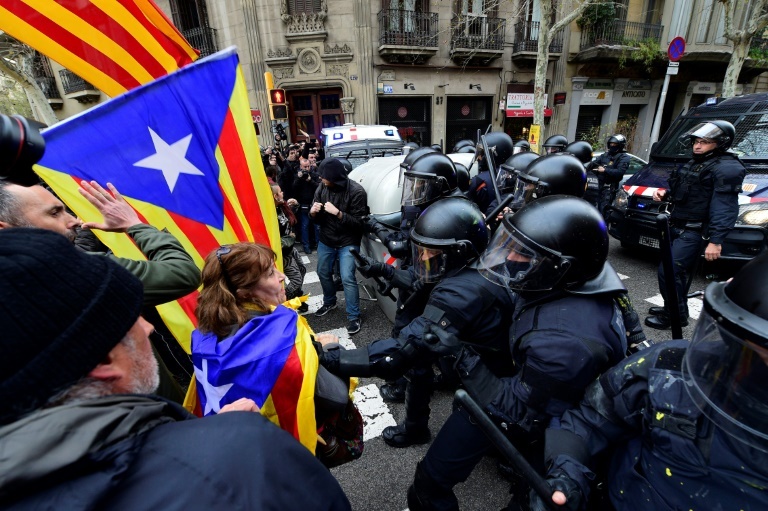 Protesters took to the streets of Barcelona and clashed with the authorities. Riot police officers in Barcelona shoved and struck protesters with batons to keep an angry crowd from advancing on the office of the Spanish government’s representative. Police vans showed stains of yellow paint reportedly thrown by protesters. Prime Minister Mariano Rajoy of Spain did not respond immediately to Mr. Puigdemont’s arrest, but Albert Rivera, leader of the anti-secession party Ciudadanos, welcomed it. Mr. Rivera accused Mr. Puigdemont of trying to “destroy a European democracy” and said that “for this, you can’t enjoy impunity,” he argued. Roger Torrent, the pro-independence speaker of the Catalan Parliament, went on Twitter on Sunday to urge fellow Catalans to form “a common front” to defend individual and collective rights. Mr. Puigdemont was arrested Sunday morning on the A7 autobahn. He was transferred to a jail in Neumünster, in the northern German state of Schleswig-Holstein, according to the German news agency D.P.A. He was to appear before a German judge on Monday. The government of Catalonia has been in a deadlock since December, when a snap election called by Prime Minister Rajoy resulted in separatist parties retaining a narrow parliamentary majority. Last week, however, separatist lawmakers could not agree on the latest candidate to replace Mr. Puigdemont as regional leader, Jordi Turull. Catalonia voted on independence despite opposition from Spain's government. What are the origins of the secessionist movement, and what has happened since the vote? Unable to win at the ballot box, Spain’s central government seems to be turning its attention to the courts. In addition to reissuing the arrest warrants for the fugitive separatists, it also jailed without bail five still in Spain. One of them was Mr. Turull. Mr. Puigdemont, the embodiment of Catalonia’s aspirations for independence, announced in early March that he was giving up his efforts to be reappointed as the region’s president. But he continued his efforts to promote the Catalan separatist cause internationally, traveling to Switzerland and Finland to attend conferences there. Mr. Puigdemont received some support from Flemish nationalists and other separatist politicians across Europe, but his call for the European Union to mediate in Catalonia fell on deaf ears. No European government leader agreed to meet him. But in a column on Sunday in the German newspaper Süddeutsche Zeitung, Thomas Urban said Mr. Puigdemont had managed to “internationalize” the Catalan conflict, and that this “cannot be in the interest of Madrid.” He argued that Madrid’s hard line risked reuniting the pro-independence movement, only days after the bickering separatists could not agree on a new leader. On Saturday, Finland’s National Bureau of Investigation said it had received the warrant for Mr. Puigdemont’s detention issued by Spain, but the police said they had no knowledge of his whereabouts. According to Spanish media reports, Mr. Puigdemont’s car was trailed by the Spanish secret service as it left Finland, who alerted their German counterparts about his arrival. With Mr. Puigdemont’s arrest in Germany, the spotlight now turns to judges in European countries who will review Spanish arrest warrants, including in Belgium, Scotland and Switzerland. The countries the separatists chose for refuge is important, because European nations have different criminal codes. Some may not recognize the charges brought by Spanish state prosecutors against the Catalan politicians, particularly rebellion. The arrest in Germany could pose a challenge for Angela Merkel, who started her fourth term as chancellor this month at the helm of a coalition government after months of tense negotiations. “Legally, the arrest of Mr. Puigdemont is not objectionable, but politically it creates great problems,” a member of Parliament from the Free Democrats, Alexander Graf Lambsdorff, told The Augsburger Allgemeinen Zeitung, a regional paper, on Sunday. In Scotland, the police said that the lawyer for one fugitive there, the former Catalan education minister, Clara Ponsati, had been in touch with them, and that they were preparing for her to turn herself in. In December, Pablo Llarena, the Spanish Supreme Court judge who is leading the case against the Catalan separatist leadership, withdrew his initial European arrest warrant against Mr. Puigdemont and others who fled to Belgium, amid concerns that the Belgian judiciary might seek to limit the crimes for which the separatists could be charged if they were returned to Spain. Altogether, the Spanish Supreme Court is seeking to try 25 Catalan separatist leaders for violating Spain’s Constitution during their unsuccessful secession attempt. State prosecutors in Spain have moved to sentence the separatist leaders to decades in prison for organizing the independence referendum in October that they say violated Spanish law. The separatists followed the referendum with their declaration of a new Catalan republic. Mr. Puigdemont is among 13 defendants who are accused of rebellion, the most serious charge, as well as other offenses that include the misuse of public funds to host the referendum.